It was cold and overcast, but not frosty, like it had been the last two mornings. On the way through town to Central Station I spotted a recently-dead pigeon in Basnett Street. It had its wings half spread, and its head up, but its breast was all bloody and damaged. It looked as if it had flown into the ground and died as it made a crash landing. Had it been chased by a Peregrine? 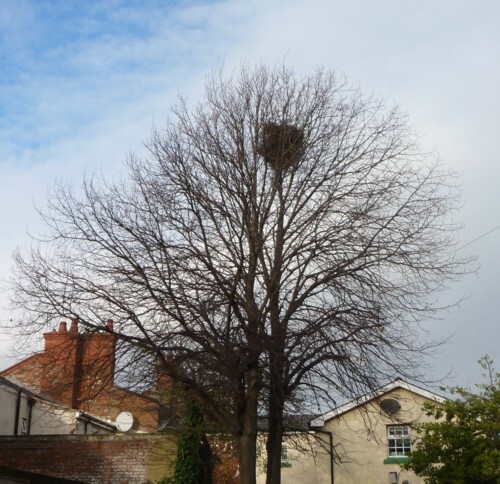 On the way from Waterloo Station to the beach there was a fine Magpie’s nest in bare tree on South Road. On the Boating Lake there were numerous Canada Geese, Mallards and Black-headed Gulls. One of the BHGs was wearing a Darvic ring, but we couldn’t get its number. There were a few Coots charging each other aggressively and about five Tufted Ducks. A small flock of Starlings were roaming about. 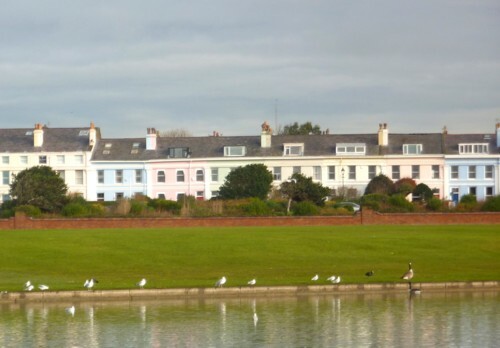 As we headed for the promenade, the sun came out rather weakly, shining on the sea captain’s houses. One Ragwort was still flowering on the dunes. The tide was coming in fast, and the gulls were high up on the beach. Most were Herring Gulls but there were a few Common Gulls amongst them. A small flock of Sanderlings arrived and scuttled busily around the feet of one of the Iron Men. We looked through the railings to Seaforth Nature Reserve, but there was nothing interesting to see, just a few Cormorants and a Heron. There was a large flock of something further back. Grey Plovers? 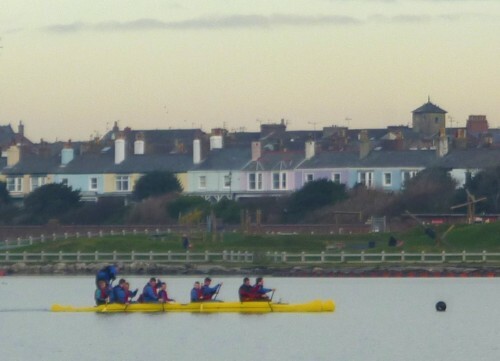 We ate our lunch overlooking the Marine Lake, watching the exertions of a rowing team. 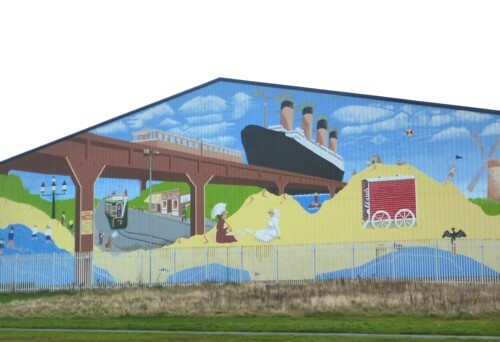 Just over the fence into the Freeport is a mural of old Crosby on the side of a big warehouse, showing the Titanic, the Overhead Railway, Five Lamps, the sand dunes, an old bathing machine and a rather splendid Cormorant! Then we headed up to St Faith’s Church at the junction of Crosby Road North and Kingsway. 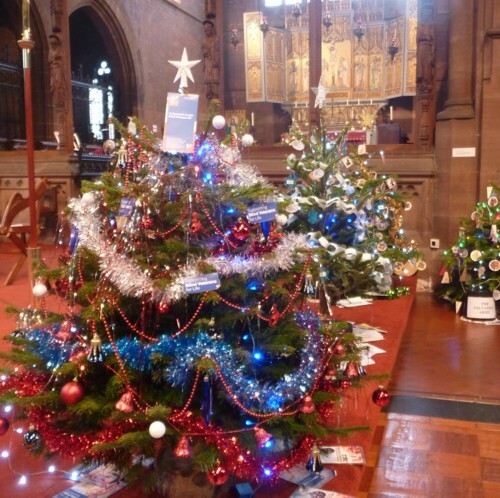 They were having a Christmas Tree Festival, with over 40 trees lining the nave, each decorated by a different charitable group. In true C of E style the ladies of the church were offering refreshments and an assortment of home-made jams and pickles. The church has a memorial to a former parishioner, Joseph Bell, the Chief Engineer of the Titanic, who was lost with the ship. They also have a stained glass window to another of their “old boys”, Robert Runcie, the former Archbishop of Canterbury. If it isn’t too early, Happy Christmas to all! No further walks until 20th January 2013. Walks in January and February 2013 will meet 10am Queen Square, and destination will depend on the weather. Anyone is welcome to come out with the Sunday Group. It is not part of the MNA, although it has several overlapping members. We go out by public transport to local parks, woods and nature reserves all over Merseyside, and occasionally further afield. 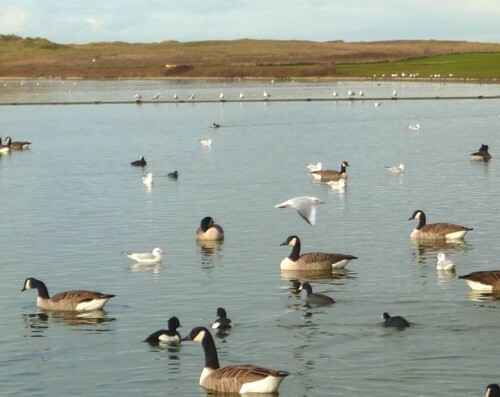 We are mostly pensioners, so the day is free on our bus passes, and we enjoy fresh air, a laugh and a joke, a slow amble in pleasant surroundings and sometimes we even look at the wildlife! If you want to join a Sunday Group walk, pack lunch, a flask, waterproofs, binoculars if you have them, a waterproof pad to sit on if we have to have lunch on the grass, and wear stout shoes or walking boots. We are usually back in Liverpool City Centre by 4pm at the latest.